Crossing into California on Saturday morning, we continue south on Hwy 395. Once again we anticipate driving alongside a large body of water - Goose Lake. On the map it is miles around and across. Not a drop of water. No mud. No dampness. For the first time since leaving the Central Coast of California in June, the terrain is so parched it's black. The golden yellows, lavender gray, and fluffy sages replaced by charcoal black shrubs and bare dirt. At the highest elevations along the route the pines and cedars are brownish red, while the undergrowth is brittle-dry. Occasionally there is a burst of bright yellow flowers, or a rich green stand of trees where underground water must still be present. It feels like they are surrounded by an encroaching army of dry-death. This area is a desert. Even in the wettest of times, this area is always a desert. This is different. 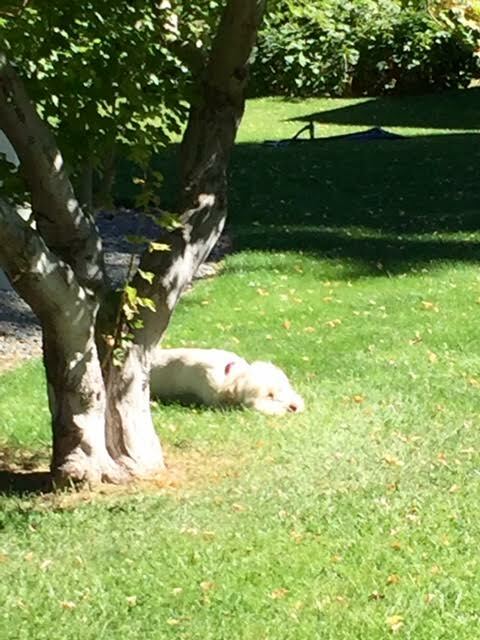 We're staying in Susanville, CA for a week. 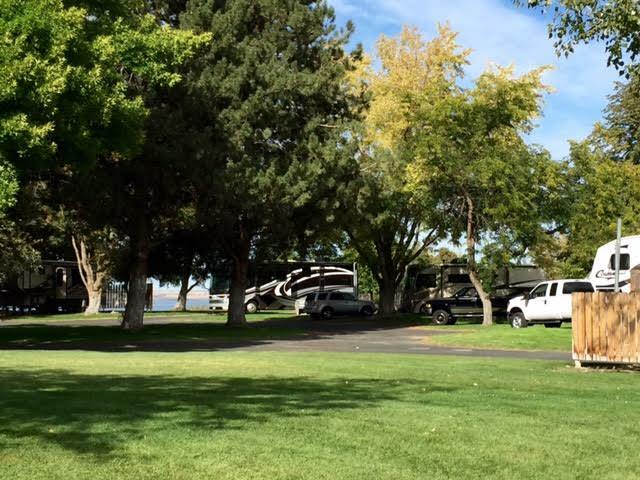 While there is a small park in Standish, about 13 miles away on Hwy 395, we opt for the only park in town - Susanville RV Park. There's a Jeep dealership here for the service we need, it's a good meeting spot to see our sister-in-law's daughter, and there are alpine lakes in the surrounding Lassen National Forest. The park is clean and nicely landscaped, with friendly hosts. Sites are close together with green space, picnic tables on concrete, FHUs with 50 amps. Our satellite works in site #71, the park WiFi is okay, and they have cable TV. Propane for sale and a dump station. Turns out the dump station is a necessity as the sewer hookups at our site, and most of the others, are elevated, making it "challenging" to keep things flowing in the right direction. In addition, the concrete pads have sunk and broken in several places. We wouldn't stay here again for more than a night or two. After enjoying our Sunday of NFL Football, we head out Monday for Eagle Lake. It's a loop drive and we start out on the southeast side. The forest is dry as expected, but near the 6,000' summit we see blue through the trees. Water! At last! We spend some time at the Day Use Area, walking about 100 yards to the water's edge. The three fishermen waded out about 10 yards aren't catching anything. There are ducks, a blue heron and even a couple pelicans. Here, plant life holds on in many colors. Tessa runs and zooms and even steps into the lake a couple feet - like us, she is so happy to find water! Continuing north, and then west, we see how big this lake is. And see that the only water remaining is what we saw near the summit. The brief reprieve from the reality of the drought is over, and once again we travel for miles along the completely dry vistas of what was once a lake. Numerous "water-front" homes are for sale. Boats sit in driveways with fading and cracking covers. 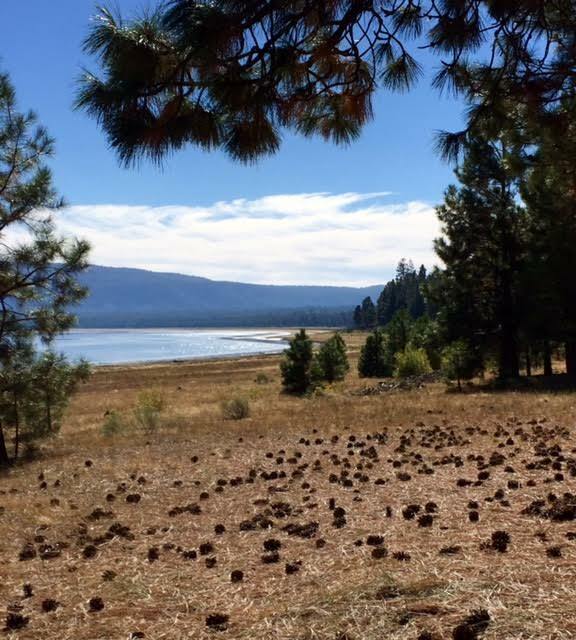 Between Eagle Lake and Susanville are three more lakes and a reservoir. You guessed it. They're on the map but no longer "there". We pull out the scope and tri-pod to view the Blood Moon, but the only clouds are in the East. After waiting and hoping, we give up. An hour later we catch the end of the eclipse without the scope, but can say we saw it! Today we meet up with Jenna and Doug who have driven a couple hours to bring me my new drum. 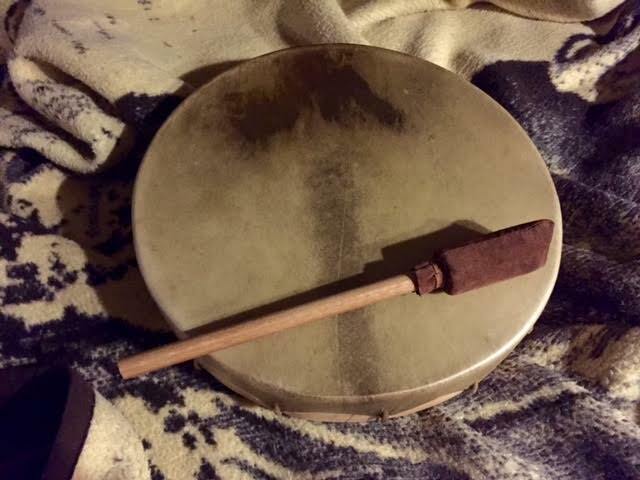 I am so excited to meet this wonderful instrument that Jenna made for me. Born on the new moon, it has amazing spirit. I forget to get pics of our meet up, and our tasty lunch at El Tepeyac Grille. Really have to get better at that. The Jeep goes to see the doctor tomorrow, and Friday we continue south. 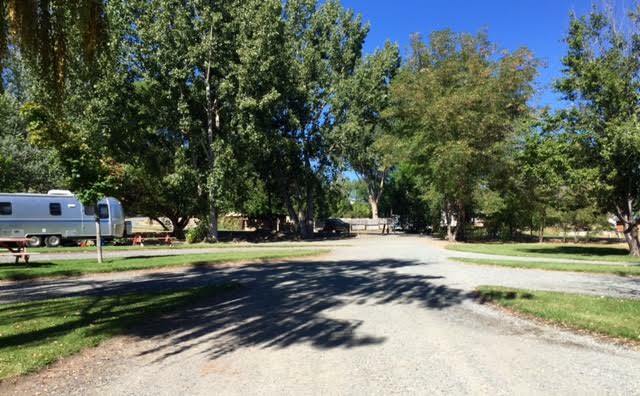 Lots of RV parks have "ranch" in their name, and probably have some décor or landscaping that give it that "feel". 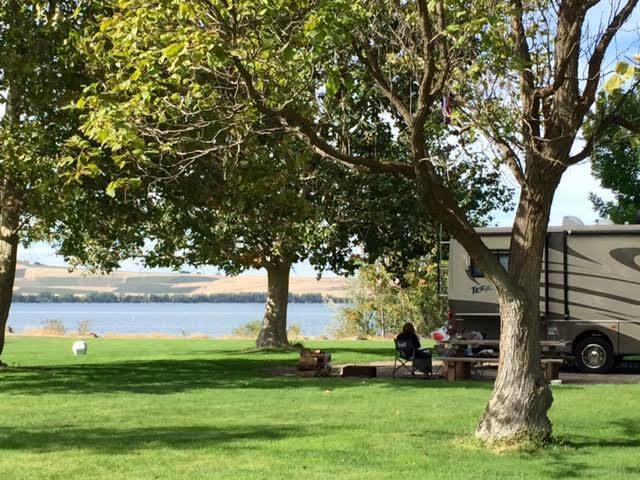 Junipers Reservoir RV Park at KV Ranch is a real working ranch. The dirt road back to the sites passes the hay barns, the working arena, the loading chutes - ranch stuff. Black angus cattle dot the hills and pastures in all directions. Ranchers move them from one area to another with horses and ATVs. Cattle dogs rest on the top of pickups with ropes and coolers in the back. Surrounded by miles of forest and plains, it is a beautiful place. 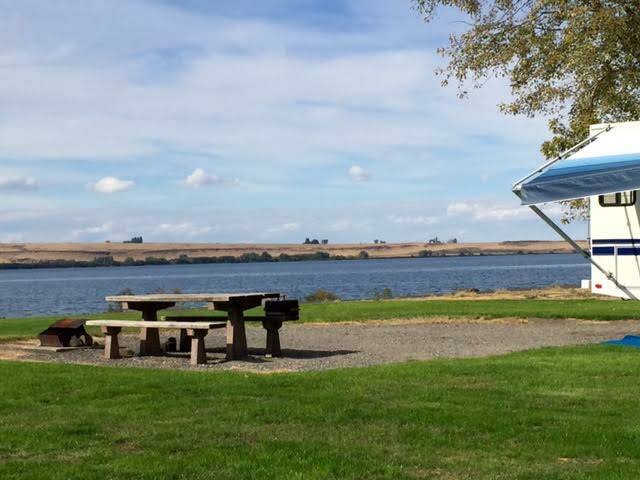 The park is open from May until October 15 with a full-time camp host living on-site. Large laundry, clean restrooms with free showers, nice group dining area, and green space with volleyball net. All sites have FHUs, 30 or 50 AMP. Several pull-throughs with back-ins along the back row. Nice cottonwood trees provide minimal shade, we had to move forward to find satellite. Really good park WiFi in our space 33. And it's a Passport America park so our cost is $16.50/night. Best deal we've had in three months! I love it here and had hoped there would be good fishing with multiple lakes nearby, plus the reservoir on the ranch. The reservoir is at about 1/3 capacity, we've seen one fishing boat in the low water. Not an option for shore fishing. Our first day we went to check out Drews Lake just over the hill a few miles. Unlike Lake Apert, that clearly held water at one time, this lake was just.....gone. A good size dent in the valley is all that's left. Cattle grazing in tall yellow grass. Scary dry. We didn't bother looking for other water, knowing the results would be more depressing. The predicted below-normal precipitation for next winter could completely change this area for years to come. So instead we just hung out enjoying the rustle of the cottonwood leaves in the nice breeze, watched a couple hawks and a coyote challenging each other for a meal, laughed at the noisy cows complaining about being moved all the time, enjoyed the prong horns along the park road, and got some chores done around home. We would definitely stay here again, especially when the lakes are restored (which I have to believe will happen). Even with the high winds on Friday that made us bring in the big slide for the first time, this is a wonderful place to spend a few days or more. I need a camera implant in my eyes. There's no other way to capture all of what we're seeing along this amazing route. Leaving the divided highway behind in Pendleton, Oregon, Hwy 395 is a well maintained, two-lane highway, that has so far been a pleasure to drive. Much of what we see is open landscapes of yellow-gold. Some is wheat fields, some is cattle range, some is grass lands. All of it is beautiful. Breaking up the miles of see-forever-vistas, are mountain ranges with cedars, pines, cottonwood, aspen and more. We've been over 4,000 feet since before Ukiah, and the summits are just over 5,000 feet. The forests are beautiful. Throughout both the flats and the ranges, the evidence of past volcanic and erosion activity makes the beautiful - spectacular. Ash flow tufts, large boulders, ridges and mesas of black, brown, red and gray are the accessories of this well dressed scenery. Finally, the changing weather gives us even more colors and textures. And all of it is saved in our heads, not in the camera, because there are very, very few places to pull off the road and use it. Attempting photos through the windows is disappointing, not doing justice to what we see. 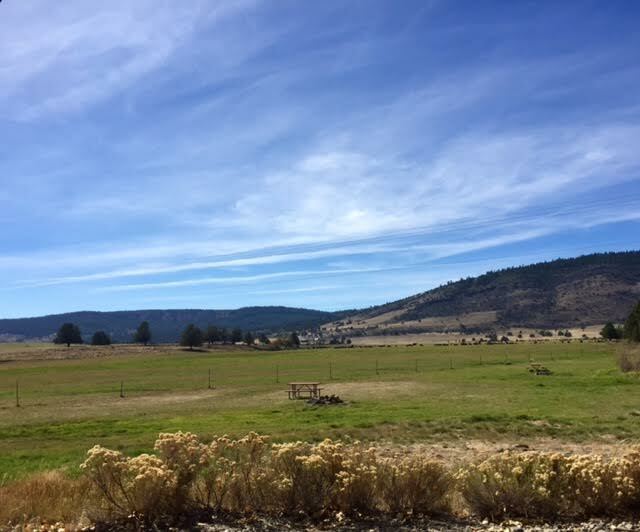 The drive from John Day to Burns now includes several miles of recently burned forests, barns, homes and bridges before the small town of Seneca. Tragic and devastating, and much more real than a news clip. Signs of clean up and rebuilding are already evident. The fire stopped at the top of the range, and the other side we found our first signs of Fall. Bright yellow Aspens with chartreuse bushes along the meandering river, and vines turned amber and maroon growing around evergreens. We stay one night at the Burns RV Park (no website). Level, gravel, clean and right on Hwy 20 - so road noise. FHUs with cable, WiFi and good AT&T service. There are two other rigs when we arrive about 1:00 and all 47 sites are filled when we go to sleep. Our longest drive since June, we travel 151 miles to Lakeview, Oregon. It will be our last stop before crossing into California. Most of the drive is open range land with gray-lavender scrub brush. It is a rough area, flat and straight. 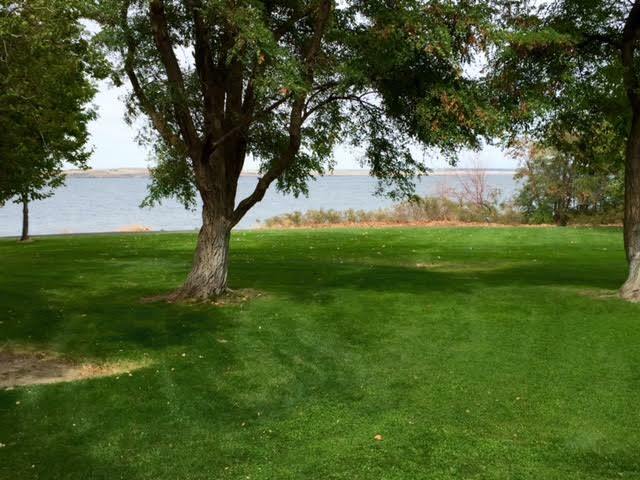 On the map 15 miles north of Lakeview is a large lake, Lake Abert. Today it is a surreal red, white and blue arena spread out over several miles. The blue is the very small amount of remaining water. The red seems to come from algae or bacteria, or perhaps from the surrounding rocks which also have the same color. The white alkali dominates the area. Another month without measurable precipitation, and the lake will be completely gone. The highway here is "exciting" with no guardrails around narrow turns and strong winds blowing (of course) down the mountain and toward the lake over the edge......and the scenery is once again beautiful. Huge ridges of dark rock rise above the road with large pieces that have broken off dotting the landscape on both sides. The rocks that made it to the water are now white, looking very different from their "siblings" that are still dark brown and red. 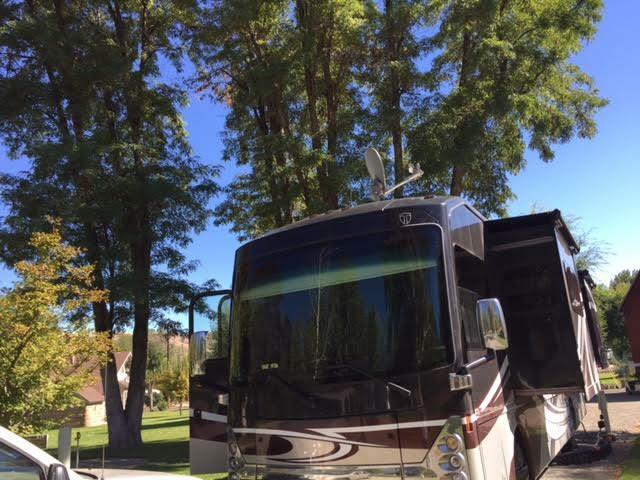 We're at the Junipers Reservoir Ranch RV Park for three nights. Antelope, coyote, hawk, prairie dogs and lots of cows greeted us. In addition to the geological wonders of the area, I want to see the Kam Wah Chung State Historic Site in the town of John Day, Oregon. 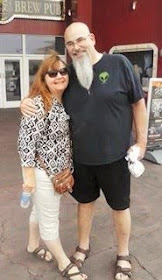 Not really Bill's thing, he is a trooper going with me to both the small interpretive center and the site itself. It is just the two (and Tessa) of us for the 11 AM tour and our guide, Haley, is knowledgeable and personable. Sad and inspiring, the story of this place is like much of the history of our treatment of immigrants. In this case it is that of the Chinese who came here to work the gold mines. The inspiration comes from the two men, a doctor and a businessman who built a safe haven for the Chinese community just outside the limits of John Day. Within the small building was an apothecary, a doctor's "office", a general store, several altars, boarding house, and the home of two incredible Chinese men who lived and worked there for over 30 years. They never returned to the wives and children they left behind in China. What makes the place so incredible is the preservation of everything found when the building was reopened in the 1960's. Nothing has been added, nor taken away. The unopened boxes of herbs, the jar of peanut butter, the fork left on the wall - all are today as they were when the door was closed back then. There are many anecdotal stories of the men and the site, but my favorite "take-away" was the true legacy of Dr. Hay: his great-grandnephew is the current president of the American Medical Association. The drive from Ukiah to Mount Vernon takes us over three summits, the last at 5K, and the views are beautiful. Having finally figured out the nuances of driving the transmission through the mountains, it is an enjoyable 100 mile trip. Many of the great places we've seen this summer have been fun surprises, found because they were en route to somewhere else. Others have been destinations we were looking forward to. One of those is John Day Fossil Beds National Monument in Eastern Oregon. Bill majored in Geology, has a small collection of fossils he dug himself, and we both love interesting earth art. 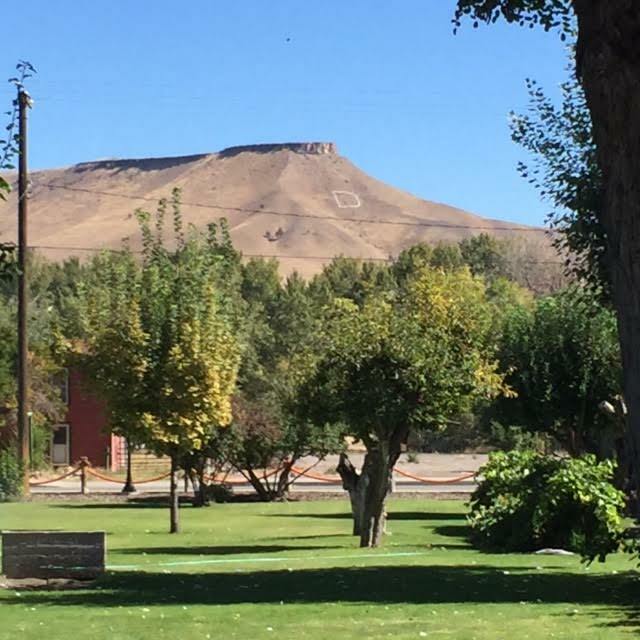 There are several places to stay in the area, and I originally had us at the state park in John Day. While visiting with Allison and Tom in Snoqualmie River, she told us about a small park in Dayville, just 8 miles from the monument. I called and booked four nights. Fish House Inn and RV Park is a small craftsman-house-turned-lodge, and six FHU RV sites in a beautiful park-like setting. The owner, Mike, has a lovely and peaceful spot here in this little town. Level gravel sites with 50 amp hookups, large laundry room, immaculate restrooms with big, free showers, and a lot of green space. There's even a hammock with pillows hung between a couple trees :-) Fairly good WiFi, half of the sites pick up satellite, but we have no AT&T service. Photos and descriptions from other bloggers are why I want to see this amazing place. But they can't compare to seeing it in person. We spent all Saturday saying "Wow!" The monument is three different "areas", the closest being Sheep Rock. This is also the only area with a visitors' center. More than just a VC, the Thomas Condon Paleontology Center tells the 44 million year story of the area through fossils and geological layers. Fossils are displayed with murals called "visual hypothesis"
Without satellite last Sunday we missed the first week of the NFL season, so there is no doubt that this week our Sunday will be spent watching every game! We're out the door by 8:30 AM heading to the section of the monument I am most looking forward to - Blue Basin. The hints of blue from yesterday's drive have me even more excited about this earthly marvel. About half way up the trail it becomes apparent the lighting is all wrong this time of day. Some small spots of light blue are visible along the way, but the basin is very disappointing. What should be creamy blue walls are more dull gray. Still interesting, but not what I was anxious to share with Bill. Although I'm sorry to miss the real blue, it's nice to get out for some fresh air early on what will be an "indoors" day. And the drive through the monument is beautiful in any light. Continuing south on Hwy 395, we left Sprague, WA on Tuesday with a little wind and rain. More rolling golden hills and lots of large farm equipment working the fields made for a beautiful rural drive. This section of Hwy 395 is divided four-lane, and the 160 miles to Boardman, OR went by quickly. I chose the Boardman Marina and RV Park to be on the water (again). The green city park looked like a pretty spot. It is about 40 miles "out of the way" from the direct route, but was worth it. We were in Space 28 in Circle C and had unobstructed views of the river across a beautifully maintained green lawn. The lovely trees also meant no satellite, but we had plenty to do. Space 24 doesn't have the view, but I think you'd get satellite. The restrooms and laundry are immaculate. A 3-mile paved bike path runs along the river. No cable, no WiFi. We had five bars of AT&T. Boardman is another small town with a local grocery store, NAPA auto parts, half a dozen eateries, a large lodge and grill on the river, two gas stations, and the marina. People in town and in the park are very friendly. We took these two days to do some maintenance on the rig and stock up on groceries. Enjoyed a nice dinner at the lodge one night, and a nice camp fire on the other. Over a month in Washington, with a burn ban in place the whole time, this was our first camp fire in weeks. The weather was perfect, it was quiet except for the barge that "huffled" by and the "chug-clank" of the trains on the other side of the river. A lovely evening. Washed the windows so naturally it rained on Thursday morning :-) We headed out about 9:30. Along I-84 is the Greenwood Tree Farm. It is a huge grove of very tall trees. Clearly planted in grids, they are stripped of all branches over half way up, and are very straight. Bill looked it up and it is an amazing operation. Over 7 million Poplar trees! Grown for lumber, the grids are staggered plantings that are harvested after 12 years. The groves have been growing for so many years that they create a natural habitat for deer, fox, coyotes, and numerous birds. 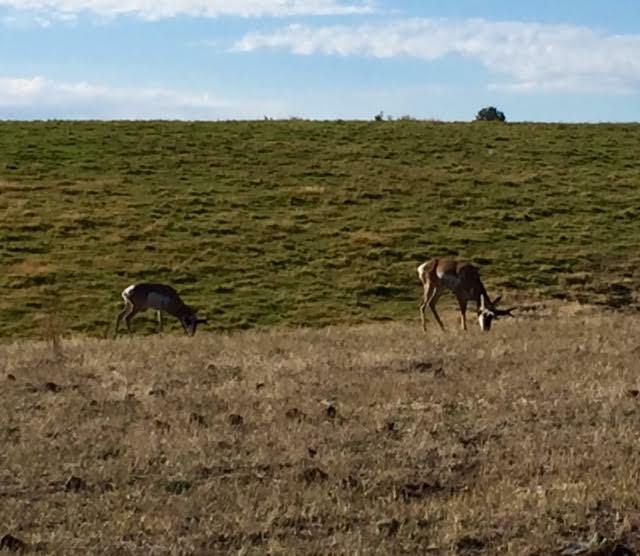 When a grove is harvested, the wildlife move to the newer ones. It was refreshing after all the clear cutting we saw in parts of Washington. A lot of water on the road as we followed the morning's rain. There were only four other vehicles heading south and maybe two dozen going north. It was another nice drive through the country. The climb to Battle Mountain Summit is subtle and while the road has no guard rail on the big turns (we were on the outside again), the road is nice and wide and there was no repeat of the Mount Spokane "incident". Our destination was a one-night stop in Ukiah, OR. Again, could have pushed through to John Day, but we aren't in a hurry. The Stage Stop RV Park (no website) is on the main street where it heads out the other side of the tiny town. Another place that has seen better days - with incredible views and friendly folks. The owner looks like a younger and trimmer Mrs Claus with gray hair and a wonderful smile that lights up her eyes. The office is in her home and the smell of apple pie baking was mouth watering. I nearly asked her if she would consider adopting me. Five pull-throughs and one back-in with FHUs, four cabins, small laundry and shower house, and the office make up the small park. Dirt sites are level with grass strips, and have picnic tables and fire pits. Best part is all the wildlife and the amazing views. It was a great spot to spend the night. And with satellite finally accessible again we got to enjoy the Thursday night football game! We continue south on our Hwy 395 sojourn to SoCal.